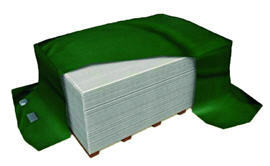 Chinsun wood grain fiber cement cladding is a unique fiber cement composite of natural fibers bonded in a high-grade silicate structure tightly. This autoclaved wood-grain siding acquires impressive toughness, yet remains flexible and dimensionally stable. It is cellulose cement cladding that contains absolutely NO asbestos fibre, no fibre glass fibers nor formaldehyde. Chinsun Siding. Anything Else is Just a Façade. Chinsun fiber cement cladding is simple to handle and easy to install and is therefore suitable even for the Do-It-Yourself (DIY) segment. Chinsun cladding is a fibre cement siding and is fire resistant to class A1 and made in accordance to EN12467. Chinsun fiber cement cladding is also water resistant, insect and rot resistant and therefore requires very little maintenance. 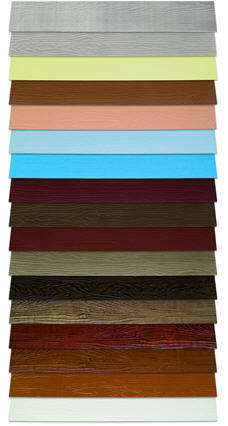 It is the perfect cladding for any house that needs a simple, yet durable cladding material. Chinsun cladding comes in several sizes and textures to match your housing needs, making it easy to select your desired interior/exterior cladding materials. It is also a perfect solution for all wood-cladding houses that face a constant threat from termites and water damage since it possesses excellent properties of pest resistance, impact strength and water/moisture resistance. 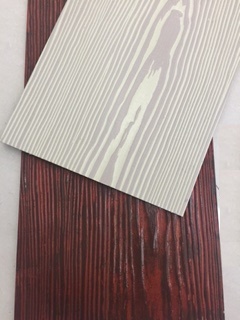 It comes in several sizes and textures and primed planks can be coated before or after installation (double coating) with optional acrylic paint. Framing: Chinsun fiber cement cladding can be fixed to both timber frames (minimum size 1.5 x 3 inch) or steel frames (thickness between 0.55 and 1.6 mm). Fixing: The fiber cement siding can be fastened with both nails or screws. 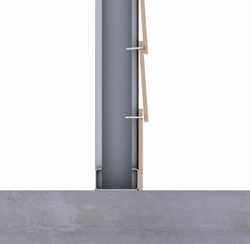 It can be nailed directly to timber supports with round wire nails. When using metal screws, the size and length of the screw will be dependent on the thickness of the siding and the gauge of framing. Pre-drilling the plank is a must unless self-embedding, self-drilling head screws. Installation: Fasteners must be located more than 12 mm from plank edges and 20 mm from plank ends. 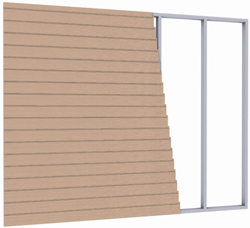 When installing in an overlapping plank cladding style, siding installation must be started at the bottom of the frame. The subsequent row of planks should overlap previous row by at least 25 mm. Tools: No special tools are required. 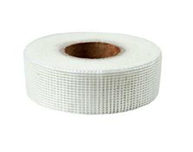 The product can be used with normal nails, fastened by normal or self-drilling screws and cut by electric power saw with diamond blade. The following accessories are available for use with Chinsun fibre cement cladding. Deliver Chinsun fiber cement cladding to project site in original, unopened package and store them in fully enclosed space where they will be protected against damage from humidity, direct sunlight, surface contamination and other causes of damage. 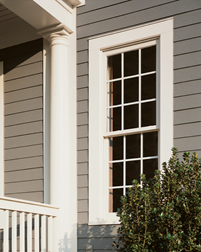 Handle our siding carefully to avoid chipping edges or damaging units in any way. Handling and storage practices should follow the manufacturer’s suggestions at all times. Stack planks on a pallet. Cover with a tarpaulin or other waterproof sheeting. Carry the planks as shown in order to avoid damage/breakage or injury.